MP4 is probably the most common file type we convert to. Whilst it is a very popular format there are limitations and disadvantages to the file type. The most common issue being compatibility between smart TV’s, BD players and other devices that support USB playback. In most cases it’s due to these devices only being able to support the FAT32 file system. So what does that mean? FAT32 only supports files up to 4gb in size. Short duration videos are not a problem, however, longer video clips either need to be split into separate files or the compression ration / data rate needs to be dropped to ensure the rendered file is less than 4GB. Typically a 1h30 minute file with a data rate of 6mb/s will be around 4GB. Lowering the data rate will result in a loss of quality. As always with digital files it’s a trade off between file size and quality. Files larger than 4gb can be copied to external flash storage however the external storage device needs to be formatted as NTFS or exFAT and these file structures are generally not compatible with smart devices. If you are streaming your files from a computer then typically the above is not an issue as most PC’s are formatted as NTFS and MAC’s generally support exfat or MAC OS Extended file data systems. If you would like us to convert your videos to MP4 files, consider where the files will be viewed and on what devices. Let us know your preference and we will do what we can to ensure that your files are compatible with most devices. Due to varitaions in manufacturer specifications we cannot guarantee that the files will play on all devices. If for any reason the files do not work on your computer we suggest downloading VLC Player, we have found VLC Player to be one of the best media players and it’s free. If you have any concerns regarding the various file types and format options please call or email us. We often get asked how SP and LP modes differ. Most if not all manufacturer’s of domestic tape based recording systems such as VHS and Hi8 offered different recording speeds to extend the duration of the tapes. In basic terms the speed of the tape while the machine was recording was reduced, this offered longer recording times. There was however a trade off. Image and sound quality suffered in most cases. A 3 hour VHS tape in LP mode would have the capability to record for 6 hours. 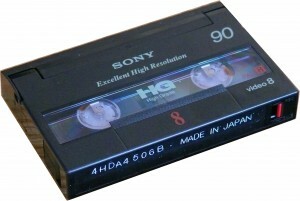 Some VHS decks offered an EP mode which further extended the recording times. Most camcorders also offered LP modes to extend the recording times of cassettes which only offered relatively short recording times. A 45 min VHS C could record for up to 90 minutes in LP mode. Professional decks did not offer LP modes and as such cannot play tapes recorded in LP. Domestic VCR’s that offered LP modes automatically detected LP modes by monitoring the control track and adjusting the playback speed accordingly. 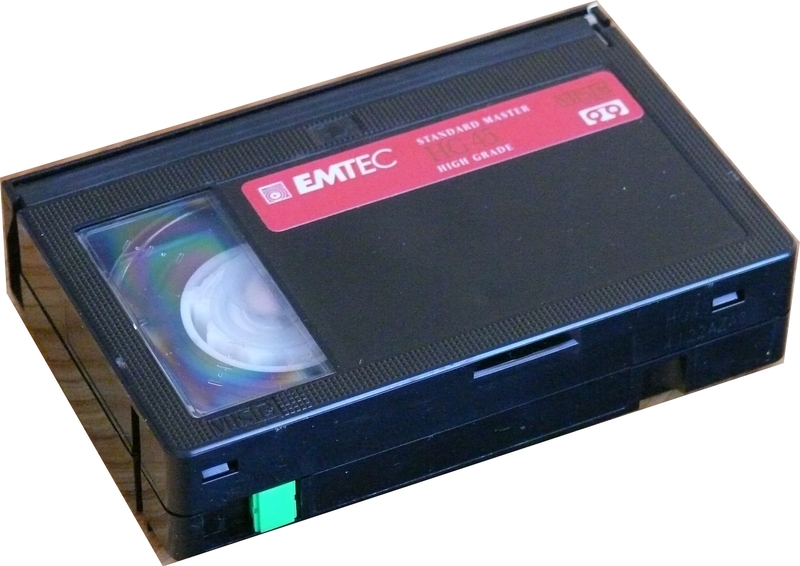 VHS and 8mm video formats are vastly different and are not compatible with each other. VHS is half inch tape while Hi8 is 8mm. The recording formats also differ hugely in terms of the way the information is recorded onto the tape. VHS has a smaller cousin VHS C (Compact). VHS C or Compact was introduced to compete against 8mm / Hi8 in the consumer camera market. 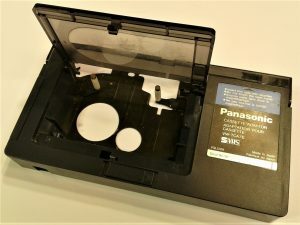 VHS C had one advantage over 8mm in that one could use a VHS cassette adaptor which would allow the smaller or compact cassette to be played in a normal VHS VCR. Only VHS C tapes fit into the adaptor. There is no adaptor to convert a 8mm tape to fit into a VHS machine. Apart from the obvious differences in physical appearance and size, other factors such as tape / video head speed ratio, FM vs longitudinal audio recording and synch signal recording make the formats technically incompatible. I would argue that 8mm / Hi8 was a better format, image and audio quality was superior to the VHS C format. So how do you get your 8mm tapes converted? You will need a 8mm player of some description. Sony launched 3 different formats in the 8mm range. 8mm, Hi8 and Digital 8. A Video 8 player / camcorder will only play 8mm tapes, a Hi8 player / camcorder will play Hi8 and 8mm video. A Digital 8 player will play all three formats (generally speaking, there may be some model variations that this does not apply to). DVD Conversions are specialists in tape and media transfer, having been in the professional video market for 30 years. We have all the equipment to playback all the popular video formats. Call us today to discuss your tape transfers. We can convert 8mm, Hi8 and Digital 8 tapes to DVD or digital files. Click on the links to be directed to the relevant page. In a previous blog we explained the video to DVD process and the pros and cons of DVD. In this blog we will explain the video to Digital file process. The file type is generally determined by what it will be used for. If the files are going to be used primarily for uploading to services such as YouTube, dropbox or other file transfer services then highly compressed files are probably best. There is always a trade off between file size and quality, large files = good quality, small files = lesser quality. MP4 is a good trade off between the two and is compatible with the vast majority of media players and smart devices. It is best to convert to files that have a low compression ratio (MOV / AVI) or as close to uncompressed as possible. High compression files (MP4) can then be created from the low compression files. Remember that once compressed the files cannot be “uncompressed” without a loss in quality. Visit our online museum. We will be publishing photo’s of our collection of old film and video equipment. We welcome your comments and if you would like to contribute, please contact us.